This is 190-ft two-tiered Starvation Creek waterfall and is quite impressive, tucked away behind the more-popular rest area.Starvation Creek Falls, is a two tier waterfall located in the Starvation Creek State Park at the north skirt of the Columbia River Gorge, in Hood River County, in the U.S. state of Oregon. 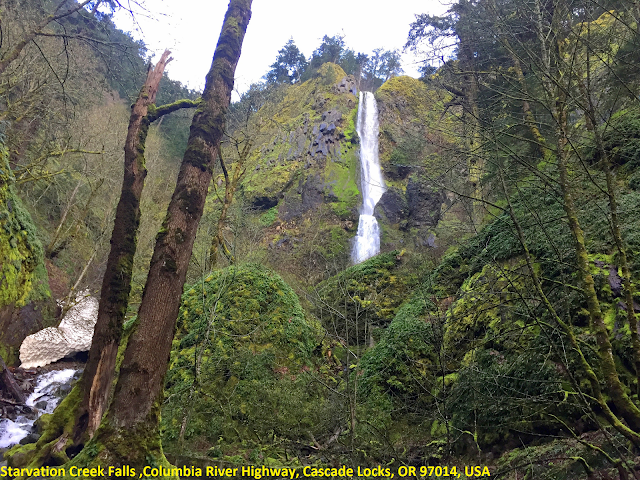 It is located in a privileged area along the Historic Columbia River Highway, where four waterfalls are located in the Starvation Creek State Park. It's directly off I-84, making for a quick stop to take in a bit of history and beauty. Follow the path and signs to the waterfall and a couple of creek-side picnic tables at the base of the falls. Make sure to read the informational panels sharing the story of the waterfall's name. You can continue on the paved Historic Columbia River Highway State Trail for another mile to the east taking you to Viento State Park. This area is also the trailhead for many other hikes including: Starvation Ridge Loop and Mt. Defiance—leading you past many more mysterious and stunning waterfalls.